Who's the real mastermind behind the terrorists who capture Tony Stark in the Iron Man movie, coming May 2? We have the first clues below, along with a new clip. Another new video gives some hints about what could be coming next on Lost, and a new trailer shows off a lot more of the story in Speed Racer. And we reveal even more secrets of Doctor Who's Christmas special. 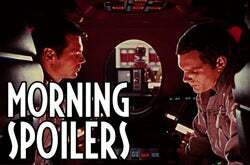 All this, plus new hints about Hancock, Joss Whedon's Dr. Horrible and Battlestar. This morning, we spoiler in Hell! Some early reviews of Iron Man give away a lot of plot info, in between proclaiming how awesome it is. Tony Stark is in Afghanistan, showing off his new Jericho missile, when he gets captured by a terrorist, Raza. Then we flash back to his life before his kidnapping and meet his assistant, Pepper (Gwyneth Paltrow) and his sidekick Jim Rhodes (Terrence Howard). A woman journalist tries to interview Tony but ends up in bed with him. The Mandarin, Iron Man's arch-nemesis with the ten powerful rings, probably doesn't show up in the movie, but his criminal organization (symbolized by an "X" and ten golden rings) is behind Raza. And Raza the terrorist later teams up with Obadiah Stane (Jeff Bridges), Tony's mentor who turns on him. When Tony gets back from Afghanistan, he announces that Stark Industries is out of the weapons business, which is when the rift with Stane begins. As we've been told, we don't get to see Tony's sidekick Jim Rhodes suit up as the armored War Machine in this movie. But Tony refers to Rhodesy as a "war machine" at least twice, because whenever Tony follows Rhodes' advice, violence and mayhem result. Yin Sen, the doctor who helps Tony build his early armor in the cave when he's a prisoner of Raza, is a Lebanese-Gulmirian(??) doctor who's kidnapped by Raza to keep Tony alive. Tony doesn't really build the second version of his armor himself, he just tells the computer to build it for him, and the computer says it'll be ready in five hours. Tony's armor includes "caller ID" and various other silly toys. There are a lot of sequences of Tony getting used to the armor and figuring out what he can do with it, including some pratfalls that you may already have seen. Here's a new international trailer for Speed Racer, which shows off a lot more of the film's story, including the million-dollar reward that the villanous Royalton puts out for Speed's head. And the suitcase of money that Royalton offers Speed to sell out. And you can see more of the sequences where people try to muscle in on Speed or just obliterate him with rocket launchers.